Thus will Maitreya guide the thoughts of men towards the Truth that He brings and is. Thus will Maitreya show men their errors and the solution to their dilemma, and thus will men take stock of their situation and, in growing numbers, realize the Truth of His advice. More and more, men will see that Maitreya’s guidance is the only way to achieve the happiness and peace all inwardly crave. Held back by fear until then, they will find in His simple Teaching the answer to all their fears and woes. Naturally, not all will find in Maitreya the guide they seek. Many, indeed, will find in His Teaching, all that they fear and hate. Gradually, however, the ardour of those who can respond and resonate to His simple words of Truth will bring millions to His cause of Justice and Peace. His Teaching, though simple, will penetrate the hearts of all those in whom love has not yet been extinguished. Thus will Maitreya work throughout the world, drawing to His side all who long for a new start, a simpler, happier world wherein to raise their families in peace and harmony. The Day of Declaration will be the signal for that new start for Planet Earth. On that day without precedent, men will experience the Oneness of which Maitreya speaks. They will sense that all humanity is undergoing the same experience. They will feel a humble pride in being one of a huge family of brothers and sisters whose hearts are beating together in a love altogether new. This sense of belonging together will embrace them and bring tears of long-forgotten joy to each and every one. Q. The Irish vote against the European Union calls into question its continued existence. Was the EU doomed from the start? Or could it be transformed into something more positive – along the lines of the British Commonwealth model? How does the Hierarchy see the EU? A. The EU was founded as an economic common market. It is not part of Hierarchy’s Plan that the individual countries of Europe be ‘lost’ in a unified political State of Europe. That should not be allowed to happen. The idea of such a state is driven today by the forces of Commercialization and need to be resisted. Q. How can Iran convince the international community that it is being truthful when it says that it is not seeking to develop nuclear weapons? Further sanctions are being threatened and Iran is experiencing growing pressure on it, particularly from America. A. It could invite UN observers into Iran to check and confirm (or otherwise). Q. A glance at the daily news seems to indicate that popular protests are taking place around the globe, giving the impression that people power is on the rise. Is this a false perception? To some critics, marches, protests, demonstrations are anarchic acts undermining the true mechanisms of democracy. Your insights, please. A. No it is not a false perception. It is true that rising prices of food and oil and local shortages of staple foods are the main cause as yet, rather than more abstract international causes like Justice and Peace, but it is a step in the direction required. Q. The Vatican seems to be saying publicly that life might exist on other planets. Is the Vatican easing its flock into the notion that life exists on other planets, that UFOs and all accompanying phenomena are real? What’s behind this policy? A. Quite simply, yes! The truth is beginning to come out and the Vatican cannot afford not be aware of the obvious. Q. Maitreya has said that we are our “brother’s keeper”. Does this apply on an international scale? For example: should the rest of the world stand by while a country like Zimbabwe spirals even further out of control into devastating chaos? Some call for the Zimbabwean people to rise up and overthrow the corrupt leadership. The world expects African leaders to take action. Meanwhile the violence, misery and hunger escalate. A. The United Nations should be invited by the African leaders to investigate thoroughly and act if necessary. Q. (1) Should the outside world intervene to help the plight of the Burmese people first denied their rights, now in desperate straits? (2) Is sovereignty inviolable? A. (1) Yes. (2) Not in such circumstances. Q. People who are starving, or at least having difficulty feeding their children, offer a simple answer to the present food price hikes and rising fuel prices: ‘Bring the prices down – then we can all eat again and move and run our homes and businesses and earn a living’. Is it as simple as that? A. No. The present economic system does not work. These events are the symptoms. There is really no shortage of food or oil. The answer is simple – sharing alone will right the wrongs of the past and present. Q. Israel is building more settlements which will double the present number. Ambitious expansion plans have just been approved for settler homes in East Jerusalem, which was captured by Israel in the 1967 Arab-Israeli war. What are the obligations of the international community vis-à-vis this ongoing crisis and conflict? A. There are already over 60 UN resolutions against Israeli contraventions which are simply ignored by Israel protected by the US veto in the Security Council. It is necessary that the Security Council be abolished. It has long past its usefulness. The International Community must also stand up to the US abuse of power. A. No, they were not natural and they were not directly man-made or manipulated. Nor were they the karmic result of the government of Burma or China’s misdeeds. They are the result of tension and the resulting stress which unleashes forces which cannot be contained. For example, humanity does not understand the Law of Cause and Effect, the Law of Harmlessness. We have tremendous tension in the world today because of the Iraq invasion – a totally illegal, unnecessary and ghastly war, costly in human lives. That war, the invasion by the Americans and the British has created extraordinary tension in the world. That, as well as the war in Afghanistan and American pressure on Iran, causes inevitable fear across the world. So people are living in a state of tension partly because of the great cosmic energies but also because of the actions of powerful individuals. And people watch in silence. This country [Japan] watches in silence because you are allies of America. But all nations of the world must raise their voices against this trampling on other countries by America. America is a great nation and will become a greater nation but it is sadly out of step with its destiny. It is playing with forces it does not understand. It is a young, powerful and extremely arrogant nation. It is the arrogance of youth, especially strong youth. It is time that the older, wiser nations of the world raised their voices against the actions of America. The best way to do that is to encourage the acceptance of sharing. Sharing and justice will bring tranquillity and balance to the world. When we are out of equilibrium as we are now – the sub-human elemental forces, which organize the cyclones, earthquakes and so on, the forces of the planet itself, go out of equilibrium. Where you have regular tornados – they become massive; where you have regular earthquakes – they become massive earthquakes. The elemental forces respond to our stress. Humanity has to understand the connection that exists between all forces and all aspects of the planet. Q. I have read about a man who lives in England and calls himself Maitreya. He is a Buddhist, provides healing and makes pyramids from gem stones to put over your bed at night. He has appeared on television late at night in a programme about alternative healing. Is this the same Maitreya you speak of and is he still in the UK? A. I know the person you mean. He has absolutely nothing to do with the Lord Maitreya, World Teacher and Head of our planetary Hierarchy. Q. In a Share International article back in March 2006, you stated that the world was heading towards ‘peak oil’ which would trigger a global stock market crash of 1929 proportions. Everything I have read recently on this subject seems to point to peak oil happening now – is this truly the case? The peak oil scenarios paint a grim picture of worldwide starvation, oil wars, etc. Is this likely to happen or will Maitreya’s Day of Declaration happen before this (ie very soon) to forestall any major calamity? A. ‘Peak oil’ is not a term I have ever used and the scenario you describe seems remote from anything I have written. It therefore seems to me that you are confusing my articles with those of someone else you have read. Whether this is so or not, I do not see the future in that way. There is in fact no shortage of food or oil. The present crisis is the result of manipulation and profiteering from fear of such loss. According to my Master there are 78 years’ worth of oil in the world at the present rate of consumption and no real shortage of food if properly distributed. Q. Dear Mr Creme, I want to thank you so much for Transmission Meditation and all your comments and teachings since I first heard about this great story in 1999. My question is: Is it better to collect money from all Transmission Meditation groups and give it into your hands to a central pool for making known this information (through television or radio advertisements, articles in newspapers), or would it be better to use the money for regional media work? A. I think the best way to use money collected at this time is to buy advertisement space in newspapers advertising talks, lectures, books, etc, giving some information about the ‘story’ as a whole at the same time for people in general who do not come to the talks. The important thing is to get the information out as soon as possible ahead of Maitreya’s emergence. Make the money available to the groups in Austria [your country]. I thank you for your kind words. Q. Interesting website. However, one sure sign of fraud is when the saviour of humanity is trying to sell books. I really doubt that Christ, Krishna, Buddha and all the others would have sold a thing. If the internet had been around in their day, they would have posted it for all to see and not try to make a couple of dollars off foolish people. This proves to me that you folks are not sincere in your beliefs. A. Interesting comment, arrived at without the slightest inquiry or investigation. Had this inquiry been done, you would have realized that Maitreya does not write books and present them for sale as you suggest, but that we (Share International) have collected His teachings and published them, free of royalties, to enlighten the interested public, as well as placing them on our website for those who have that availability. You would also have realized that Share International is a completely ‘not for profit’ organization, run exclusively by non-paid volunteers, with many sister groups, also run by non-paid volunteers, around the world. Our work is done as service – which still flourishes in this otherwise over-commercialized world. On 19 May 2008 at 2.28 pm, exactly one week after the terrible earthquake in China, there was three minutes of national silence in memory of the victims in Sichuan. My friend, her parents and I were in a restaurant in Beijing for lunch at that moment, and there was a sudden halt in everyday life, no cars going, nobody working whatsoever. A whole nation concentrating on memory, grief and compassion. Soon, I felt a tremendous energy being set free in the ajna and the heart, like during a blessing or so. It was amazing. Everybody had tears in their eyes. Strange I was not sad, but tears started running from my eyes. A moment of oneness, like a relief. I cannot tell what it was, but the energy kept flowing for some time. Did the Masters send some relieving energy? On 10 May 2008 I went to a ‘Rally for a Free Palestine’ in Trafalgar Square, London. I was early and the square was still fairly empty as I crossed it with my placard which read ‘Justice through Sharing = Peace’. An elderly woman dressed in black was passing in a wheelchair and she beckoned me over saying she wished to look at the message on my placard. She then beamed heartily and pronounced it a “very good message” and carried on her way. I was very much encouraged as I dislike being on my own at these demonstrations. Then I thought it strange that she had been propelling herself in the wheelchair with no one in attendance, and wished I had engaged her in conversation. Was she Maitreya or perhaps the Master Jesus? I. L.G, Notting Hill, London, UK. My brother Frank was driving near his home in the Cheshire countryside on a Friday evening in late October or early November 2007 when he saw some bright lights in the sky. At first he thought that perhaps there was a fair-ground nearby but then he noticed that the lights were coming towards him. He pulled into the side of the road, got out of the Landrover and watched their approach. The lights were large and in rows of three. He counted about seven rows. They came so close he thought they were going to land. He was surrounded by them as they passed overhead and he felt a sense of peace and wonder. Were they UFOs and, if so, where did they come from? S. McD., Richmond, Surrey, UK. On 10 May 2008 at Benjamin Creme’s Tokyo lecture, my sister and I were in charge of the information table for Maitreya’s ‘Hand’ cards and Benjamin Creme’s mandala art catalogues. “You don’t even know if he is alive or dead? Then this is trickery!”, he said loudly with a tone of disgust and left. A few people looked at him with a puzzled expression, but most people continued looking at the cards and booklets as if they hadn’t heard him. Although he had said: “It’s trickery”, my sister and I both felt as if he had said to everyone around us that “this was real!” His speed of contact was so fast that we were overwhelmed and could not have a conversation with him or even answer his simple question. But afterwards, many more people talked to us and we were able to respond and explain our information with a bit more confidence. Was that man a special person? (1) On 10 May 2008 at Benjamin Creme’s Tokyo lecture, my sister and I were in charge of the information table. In spite of my awkward explanation, she smiled and asked more questions like how many Masters there were, where were they, and so forth. I answered as best as I could and apologized for my poor explanations. “Maitreya will emerge when our human conflicts such as the Tibet problems and such are solved, won’t He?” she said smilingly, as if she understood very well. Was she a special person? (2) At about 8.30 pm when we started clearing up after the Tokyo lecture, a short man of around fifty-five, wearing glasses, came to our table. He was carrying a handful of rubbish and a rolled-up newspaper, and discarded them in the rubbish bin near me. He was wandering this way and that as if looking for a bathroom, so I showed him the way and he went up the steps. He came back and looked at a poster showing the image of Maitreya’s ‘Hand’ and asked: “What is this?” My sister answered: “This is a ‘Handprint’ of Maitreya, which appeared in the bathroom of a house in Barcelona, Spain.” He looked closely and asked: “Did Maitreya come to the bathroom and place His ‘Handprint’ there?” My sister replied that He did not visit but through telepathy had placed the ‘Handprint’ there. The man looked puzzled so my sister added that Maitreya is omnipresent and omniscient, so He is able to do that. The man left as if he had no interest, while murmuring: “Omnipresent? Omniscient?” He was behaving like a drunken man but I thought he actually knew everything and only pretended to behave like that. He was the last to leave and I felt he stayed to watch over us until we finished our task. Was he someone special? Then, other people began to talk to me and while I was responding to them, he put the book back on the table and disappeared. I remember now he spoke without any trace of Kansai dialect. Could you please tell me who he was? (2) On 20 May 2008, at Benjamin Creme’s Nagoya lecture, I was standing by a glass sheet that showed a Cross of Light. A woman in her early 50s approached me. She was of medium height and build with short hair, wearing a white shirt, vest with embroidery on the bottom, cotton pants and glasses. She told me that she had come from Hamamatsu with her husband, because she saw an advertisement of the lecture twice in the Chu-nichi Shimbun newspaper. “Usually my husband would not come to places like this even if I asked him, but today, he himself suggested we go. So we were able to come together. It took three hours to get here, but it is much better to attend this kind of lecture than just staying at home for three hours as usual.” She also said that when she read the newspaper advertisements carefully, she realized she had always wanted to hear this kind of information. She said: “I felt the time of change was coming. That time is now, isn’t it? It is the time to put on new clothes, isn’t it? Taking off the old ones.” She continued: “Recently, I have finally understood how to use my mind. If we clearly visualize a good result in our minds, things will go well in one way or other. If we have doubtful or pessimistic thoughts, nothing will turn out well even if you try hard. Today, everything went smoothly for us, the train and the time, and we could even get front row seats here. I don’t really like this phrase, but it says whatever one wishes, it’ll happen. It happened that way for us today. The people I associate with have completely changed now, and I no longer care for an ordinary social engagement. Life should be lived with joy. It won’t be fun to be angry.” I felt she was looking deeply into my eyes. (To be honest, I had been quite angry in the morning). While I was listening to her, a sense of respect for her welled up in my heart. She said politely: “I am really grateful that you are holding this meeting. Thank you very much.” And she went inside the hall. She came to the lobby again during the interval and bought two of Maitreya’s ‘Hand’ cards. Could you tell me if she was someone special? (3) On 10 February 2008 I attended the Kansai group meeting in Osaka. It was about preparing for the upcoming lecture by Benjamin Creme in Osaka. After the meeting, on the way to the highway bus station I stopped at a department store near the Namba station. Because I was so thirsty, I bought a bottle of cold tea and tried to open it, but it was too tight. When I looked up, I saw a small man in his 70s standing in front of me, holding out his hand toward me without saying a word. I automatically held out the bottle to him, saying nothing. He kindly opened the cap and I received it with a light bow. When he returned the bottle to me, our eyes met. His eyes were slightly smiling and I felt I was deeply loved and cared for. I thought only if human beings could look at each other with such a look of love, we would not have conflicts and fights. On the way to Benjamin Creme’s Tokyo lecture I found myself praying in the train to be shown a sign if Mr Creme’s story about Maitreya was true. At the lecture during Maitreya’s blessing through Mr Creme, I could feel tremendous light on top of my head and I felt a warm powerful beam of light flowing into my body. Although I was not feeling emotional at all, I was surprised to find tears suddenly welling up in my eyes and flowing down my cheeks. Also, I took two photographs of the cross of light display with my digital camera. While taking one photograph I saw another large white cross of light suddenly appear and spread through my camera. Hoping to capture the image, I pressed the shutter: it clearly showed on the screen. Were these phenomena manifested by Maitreya? On 17 May 2008, at Benjamin Creme’s lecture in Osaka, I stood by the cross of light display while my brother went to the bathroom. A tall, thin man in his 60s and a young man of around 20 came together to see the cross of light display. The older man showed the crosses to the younger man saying very earnestly: “Here! Look at this!” The older man kept talking to the younger man eagerly: “Incredible!” “Isn’t it amazing?” He seemed excited. I was happy to see his excitement and explained that the first cross of light appeared in an impoverished neighborhood in Los Angeles, USA. “Really? I see,” he nodded. He asked: “Does this happen due to the light?” I answered it was not because of the light itself, but a miracle happened as the light is refracted through the glass. Then the older man asked me suddenly: “You are all volunteers, aren’t you?” “Yes,” I replied. He seemed quite impressed. “That is amazing, in such terrible times to be working as volunteers. It’s really wonderful.” Then the older man nudged the younger man and they went away. Could you please tell me who they were? Apparitions of the Madonna are “springing up across America, giving messages of hope to stunned eyewitnesses”, reports the US tabloid newspaper, Sun.The article describes the experience of a 12-year-old girl in Winthrop, Washington, who was staying with family and a friend at a remote cabin during the Christmas holidays in 2007. While outside experimenting with a new camera, she noticed an unusual moving object at tree-top level and photographed it: to her surprise, the object appeared in the photograph as a lady in a white robe. About a week after the Washington sighting, Joel Sullivan, a bicycle messenger in San Francisco, saw an apparition of the Madonna. While riding his bicycle, Sullivan skidded into the side of a large metal trash bin. “I looked up and there was this blinding blue glow coming from the end of the alley, with a lady in a long dress standing in the middle of it,” Sullivan said. “My first thought was: ‘She is absolutely beautiful.’ My second thought was: ‘What is she doing here?’” The lady looked at Sullivan and said: “War will soon be over.” Then she disappeared in a flash of light. Joanne Denobriga, a volunteer with the UK Swan Lifeline charity, was attempting to rescue a distressed swan when she fell into a weir and was sucked under the sluice-gate at Colthrop Lock on the Kennet and Avon canal. She was trapped unconscious under water for 10 minutes and finally surfaced 50 feet downstream where she was able to drag herself out of the water with the aid of some willow branches. Scholars of Islam interviewed about this phenomenon said some Muslims view such apparitions as reminders that God is everywhere in nature. Busool teaches religion and Arabic at the American Islamic College in Chicago, and is an Islamic judge who rules on family issues. He points to a verse in the Quran to explain why insects might carve lines into wood to spell the word Muhammad. The verse says that every living being on Earth sings the praises of God in languages human beings can’t understand. “They don’t know Arabic. To eat the inside of the branch and make that writing, it’s guidance from God, of course,” said Busool. The British Ministry of Defence has released a file listing 135 reports of strange objects in the skies in 2007, a 40 per cent increase on 2006 when 97 were reported. The MoD file was released as part of its new policy under the Freedom of Information Act to open its archives on UFO research. While in most cases eye witnesses remain unidentified, the file mentions that in two cases the sighting involved pilots who were flying over Alderney (Channel Islands), when they reported seeing two bright orange objects. In a separate incident another pilot reported witnessing a balloon-like object in the south-west of the UK. Many witnesses report seeing bright lights, but a number of callers insisted they saw “a definite UFO”. We present a selection of quotations on the theme of ‘The New Education’ from Maitreya (Messages from Maitreya the Christ, and Maitreya’s Teachings – The Laws of Life), Benjamin Creme’s Master (A Master Speaks), and Benjamin Creme’s writings. All children need a stable background in which to grow and the exemplars of that process, a mother and father. That not all parents provide that stability or offer worthy examples is, sadly, all too true, and many factors are involved in this unfortunate condition: lack of education, poverty, inadequate housing, illness, and irresponsible and feckless adults, immature and unfit for the rigours of family life. Let it also be said that millions in every country, poverty-stricken and deprived of every amenity, strive valiantly, and mostly succeed against all the odds, to hold their families together and provide a stable and loving example to their young. They are the unsung heroes of the race who, through tenacity of purpose and endless self-sacrifice, represent the best that humanity can show. There is probably no perfect education anywhere today. Everyone has a more or less limiting, and in some cases crippling, education which thwarts their creative imagination, inhibits them as individuals, and builds fear complexes – fear of teachers, fear of examinations, fear of each other; it also overstimulates harmful competition. …. every individual should be seen as a soul. The whole of education should be geared to that. In addition, each child needs to be recognized as being unique, with a personal ray structure that is the outcome of their past incarnational experience and the soul purpose in this life – because the soul provides the rays for the various bodies. Opening of centres for young people – In Britain, Maitreya has made himself known in various ways to religious and political leaders. There are deep divisions in society, but these divisions cannot heal unless they come out openly. The social, economic and political ferment Britain is experiencing will eventually produce a mellowing of capitalism and there will be a balanced blend of socialism and capitalism. Teachers cannot control classrooms because the leaders themselves are unable to understand what life is about. They are only good at unleashing market forces and turning individuals into robots in factories. Now, responsible intellectuals will come forward, not just those who do not know how to live, who are ruled by the ballot box and ideology. To indoctrinate a child is un-divine. To impose ideologies on anyone is un-divine. Great new spiritual energies in great potencies are pouring into the world on a daily basis. This is transforming human consciousness including the consciousness of young people. Young people are sensitive. They feel themselves to be souls in incarnation, and yet everything they experience in their family, in school, and in the streets seems to be totally materialistic. It is against the very nature of the soul. The soul is oneness, wholeness, seeing humanity as one. But the child goes to school to compete with other children, to be the best, the very opposite of the nature of the soul. Schools are not there to prepare children for life. They are there to prepare children for business. One of the saddening things about present education is the way children are put down, told that they are wrong, told not to do that, that is naughty. This inhibition of the child that goes on all the time has nothing to do with naughtiness. The child has no concept of naughtiness. The child has only desires, instincts, and a looking for adventure. If they were allowed to do that without always being told that they are naughty and wrong, they would grow up without these inhibitions, this lack of self-esteem. They would feel loved, feel that their parents really cared about them, had patience for them, were ready to listen to them, speak with them, and so on. That would give an inner confidence, which reflects itself in an ability to make the best of any opportunity presented by life. What holds most people back is a lack of confidence. That is mainly the result of continual nagging by parents, putting the child down. “You’re only a child”, or: “How could you know?” Everything a child says is sneered at and belittled. I do not mean in every family, but in many. Even among otherwise intelligent and educated people you will find the same kind of down-putting, derision of their children. Children should never, ever, be derided. It is only a convenience for parents to inhibit the child so that they can keep them under moderate control. People are so overworked and tired, their nervous systems so taut, that they cannot bear the presence and demands of their own children. That is a tragedy for them, for the children and for society as a whole. Each child, at whatever level it comes into incarnation, comes into the world with its own set of purposes. A main purpose is to learn to live in peace and harmony with the rest of us, all the people with whom he or she comes into relationship. The actual possibility to do this is rare today. You are a very exceptional individual if you come into life in a family, a school situation, a national community, where everything you need to work out your life purposes as a soul is available to you. Those relatively few who have led the way in preparation for this time will find themselves offered another field of service: an educational endeavour vast in scope. From all sides will come the queries; a long-felt hunger for knowledge will, like a dammed-up river, overflow and burst its banks. Many will seek to know the background and history of this event; for others, the immediate future will be the chief concern. Still others will feel the need to analyse and to question every explanation, unsatisfied in the end with aught but their own beliefs. Persuasion and tact, therefore, must be the order of the day, so to avoid the charge of bigotry and pride. Societies, worldwide, will play their part, assuring the broad dissemination of the needed teachings. Much remains to be given, but, already, much remains unopened and unread in the hands of men. A new vista of possibilities will soon appear as men grapple with the problems of separation and division. This will release the forces and inspire the techniques of training and teaching which will bring men in due course to the feet of God. 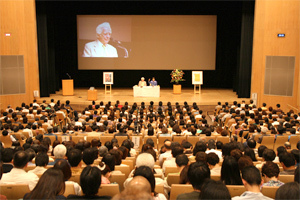 Benjamin Creme’s Japan lectures drew the largest audiences ever at all three cities – Tokyo, Osaka and Nagoya – exceeding the seating capacity of each of the halls. The large audiences were the result of the extraordinary advertisement efforts that each sponsoring group carried out this year. The most interesting episode regarding the newspaper advertisements concerned help given by Maitreya. 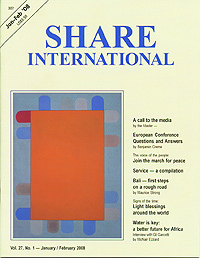 As reported in the Letters section of Share International May 2008, a group member in the Osaka area received a phone call from Maitreya, disguised as a man from an advertising agency. He offered an extraordinary discount for a full-page advertisement in the local edition of Sankei Shimbun newspaper. The Osaka group thought the advertisement might not pass the newspaper’s policy of screening out religious or politically-oriented subjects and were fully prepared to modify it upon request, but to their great surprise and joy, it was printed without any changes. About 1,150 people attended the Osaka lecture with many also watching the lecture on a monitor in the lobby. When the Tokyo (Kanto Area) group learned about the advertising story, they were so inspired that they bought a full-page advertisement in Asahi Shimbun, the largest and most respected newspaper in Japan. The group quickly raised the necessary funds and the full-page advertisement reached 4-5 million households in the northern half of Japan. As a result, more than 2,100 people came to Hibiya Public Hall in Tokyo for Benjamin Creme’s lecture; people began queuing in the rain as early as 11.30 am for the 2 pm start. Benjamin Creme’s talk in Tokyo, the first of the tour, was to an extraordinarily attentive audience. The meeting lasted five-and-a-half hours, yet most of the audience stayed until the end. Benjamin Creme’s Master confirms that Maitreya and the Master Jesus were also present, in disguise, and stayed until the end of the lecture. The public Transmission Meditation the next day drew 600 people with nearly 150 first-time participants. The Nagoya group also focused on newspaper display advertisements and drew their biggest crowd ever – about 760 people. As usual, Maitreya, the Master Jesus and the Master in Tokyo were confirmed by Benjamin Creme’s Master to be at various meetings including the Share Japan conference, and were recognized by group members (see Letters to the Editor). At the Share Japan conference held in Shiga at the end of the tour, Benjamin Creme expressed his appreciation for the intelligent, focused and dedicated work of the Japanese groups, enabling him to give his talks to over 4,000 people at three lectures. The groups are already busy looking for even larger lecture halls for next year. In an effort to energize public anti-war sentiment, US veterans of the Iraq war led a demonstration of hundreds of people through the streets of Seattle on 31 May 2008. The demonstration was held in conjunction with an event called ‘Winter Soldier’, one of a series of hearings held across the US that feature testimonials from US veterans who have served in Iraq and Afghanistan. The demonstration was sponsored by the group Iraq Veterans Against the War. Active-duty soldiers comprise the fastest-growing segment of the 1,200-member group. Many of the Seattle demonstrators were veterans who had just given testimony about their time in Iraq. On 10 April 2008 democratic elections were held in Nepal. BBC journalist Charles Haviland said turnout in much of the country seemed high. The new government, the Communist Party of Nepal (Maoist), will over the next two years rewrite the constitution. A Maoist Party leader hailed the result saying: “We believe this will take Nepal to a new era”. This optimism was echoed by Arpana Shrestha, a 47 year-old woman voting in Kathmundu who commented: “This is our chance to stop the bleeding … Always there was blood in Nepal. Not anymore”. Mukunda Maraseno, a 40 year-old bank employee, also voting in Kathmandu, told Associated Press news agency: “I came here to vote today believing this process will settle political instability for good”. On 29 May 2008, Delhi, India, was brought to a standstill when thousands of protestors set up a ring of burning tyres around the city, and brought the railway network to a halt, squatting on the tracks. The protestors were members of the Gujjars, nomadic farmers, of whom there are around 15 million in India. They are considered disadvantaged, but are seeking to be reclassified in the Hindu caste hierarchy. Avinash Bandana, a Gujjar farmer’s leader, told a local television channel that they “needed the appropriate status.” At present they are catagorized too high and prefer to be classified with ‘tribal groups’ who are the poorest in India. This would entitle them to access government jobs and university places that the Indian government normally reserves for those socially disadvantaged by centuries of caste oppression. The Indian government runs the largest affirmative action programme in the world. Nicaraguans took to the streets of the northeastern city of Matagalpa, in a protest supported by the UN World Food Programme (WFP). Senior government officials including ministers of agriculture, education, health and foreign affairs and more than 1,000 children from Matagalpa, took part in the march designed to highlight the issue of hunger and poverty in Nicaragua. Matagalpa is one of the areas hardest hit by hunger and has high rates of chronic malnutrition. The WFP is supporting and encouraging more action in 70 other cities around the world. In Nicaragua alone, WFP Nicaragua is helping feed more than half a million people including 400,000 elementary school students in the department of Matagalpa. Spain, Portugal, France, Italy, Holland, Belgium and Britain are some of the European countries feeling the brunt of rising fuel prices, while in Asia, Malaysia, the Philippines, India, South Korea, Nepal and Thailand are witnessing similar strikes and protests. The traffic jams sometimes extend for endless kilometres. Several people have already lost their lives in accidents, as workers in many parts of Europe stage strikes, go-slow campaigns and demonstrations to protest against the high price of fuel. The price of oil is impacting on workers across a wide range of the labour market. Spanish, Italian and French fishermen, Belgian and Dutch truck drivers and farmers across Europe have protested in recent weeks to demand government aid to compensate for high fuel costs, which they say are threatening their livelihoods. “Fish, in itself is not expensive”, said a fisherman from Ghana working in the north coast of Spain, “but governments abuse the price of raw materials. I totally agree with the proposal of the French premier, Nicolas Sarkozy, to withdraw tax on all kinds of fuel”.